Confession time: I’ve long been squeamish about handling any raw chicken, let alone a whole chicken. I’d always use boneless chicken breasts and thighs and end up missing out on all the flavor that the bones can contribute to a dish. Sometimes when I felt more adventurous, I’d buy breasts on the bone, throw them in the oven with as little manipulation as possible, and then ask my partner to debone the cooked meat, so that it would end up all pristine and boneless on my dinner plate. 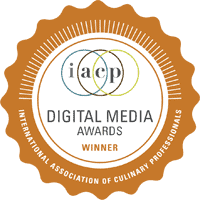 I admit, this is embarrassing, especially considering I grew up enjoying my mom’s roast chicken and watching her use everything from every bird she’d prepare, including the bones, which she’d turn into homemade chicken stock. Some years ago, as I was first starting to cook for a living, I just couldn’t justify that whim anymore. I knew buying a whole chicken was better in every way: more flavorful, more practical, more versatile, and above all, more economical. I therefore challenged myself to roast a whole bird, and then to debone it fully—without becoming squeamish. In truth, it wasn’t as bad as I expected it would be, and although it took me a couple of hours to bring myself to actually eat the chicken, I was amazed at how juicy, tender, and flavorful the meat was. I was also impressed by the large quantity of meat I pulled from the bird, and was able to enjoy many delightful, super easy meals over the next few days. I still buy boneless meat from time to time, and handling raw chicken still isn’t my favorite thing to do in the kitchen, but I do roast whole chickens regularly. There’s just no comparison to the meat you’ll pull from a freshly roasted bird! I’ve tried many recipes over the years, but my latest favorite is this Spatchcocked Chicken with Lemons and Oranges. 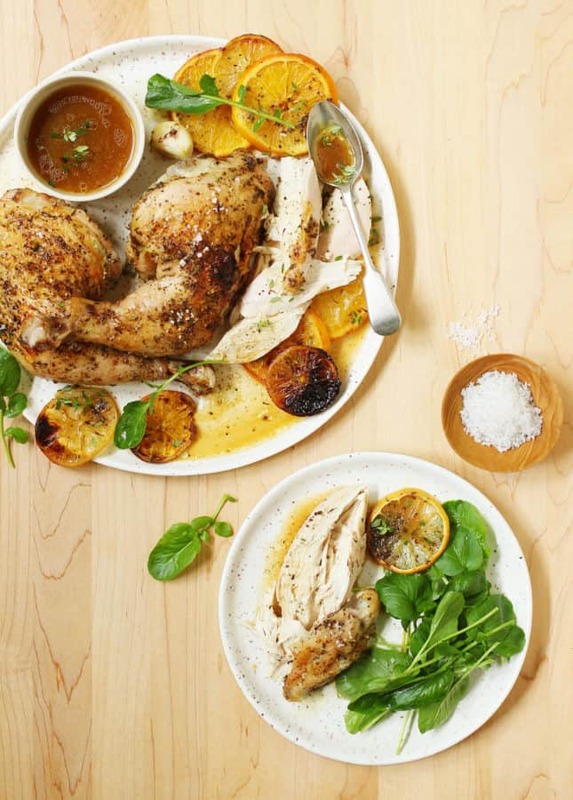 I love this recipe for one obvious reason—caramelized lemon and orange slices!—but also because spatchcocking a chicken (roasting it flat) allows it to cook more evenly and produces more crispy skin. 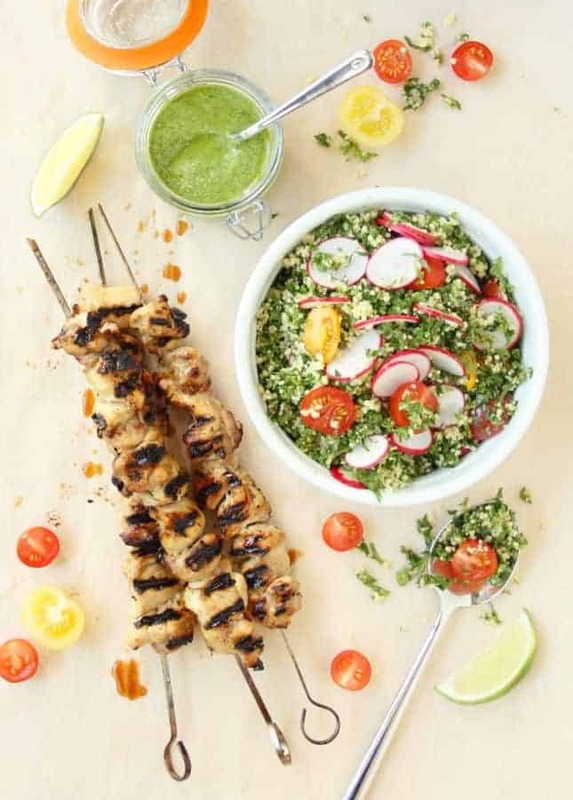 The recipe comes from Julia Konovalova’s new cookbook, The Ultimate One-Pan Oven Cookbook, which is brimming with easy, colorful recipes that are packed with flavor. 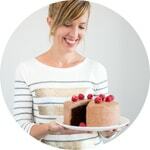 I’m always looking for new family-friendly weekend meal ideas, so after gawking at the cookbook’s gorgeous photos, I bookmarked over a dozen recipes and started cooking my way through the book. The first two recipes I tried in Julia’s book became instant favorites: the first one is the Easy Oven Seafood Boil, which produces a generous tray of roasted scallops, shrimp, salmon, corn, and potatoes with incredibly little effort; the second one is the Hoisin Maple-Glazed Salmon with Vegetables, which we inhaled in one sitting, despite the fact the recipe should’ve made plenty to feed the three of us for two meals. The hoisin maple glaze is that good! After these successful tests, I can tell you that I’ll regularly be reaching for Julia’s cookbook when I want to make a no-fuss, delicious family dinner. 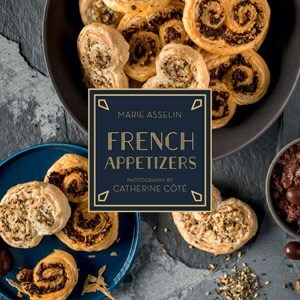 The book contains a wide variety of dishes, from breakfasts and snacks, to soups, salads, and even desserts. The recipes are straightforward but not boring, the instructions precise but not too wordy, the ingredients interesting but not hard to find. And the best thing, in my opinion: you’ll end up with a scrumptious meal, but few dirty dishes—which is what makes me happiest on a weeknight. This bright Spatchcocked Chicken with Lemons and Oranges will now be on heavy rotation at my house, too. 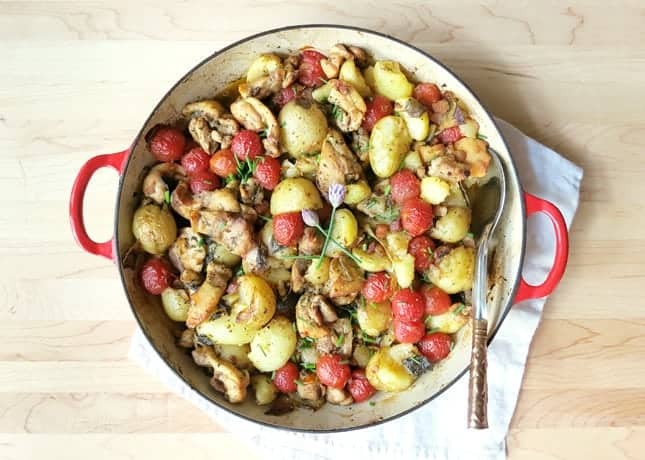 The dish comes together quickly: you basically simply pile on the ingredients and flavorings, add the chicken, and then throw the dish into the oven. 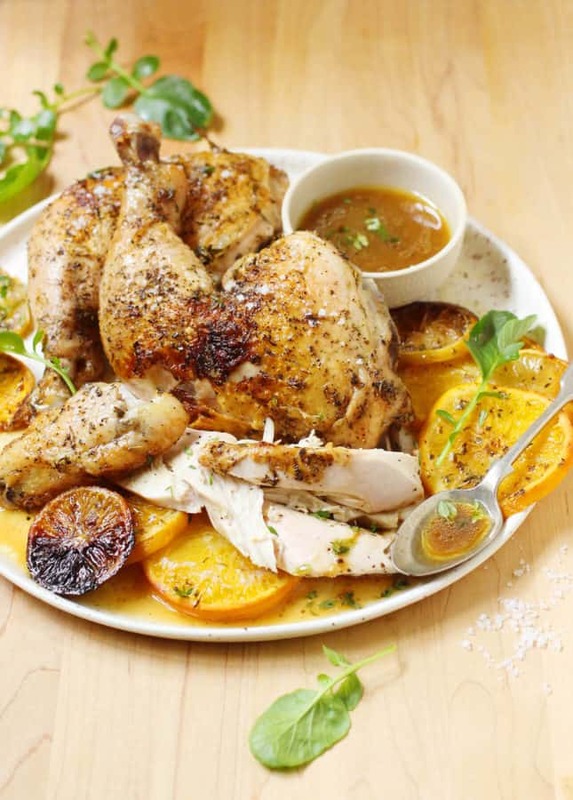 During the roasting process, the chicken, lemons, and oranges release their juices to create a delightful pan juice, which you’ll drizzle the meat with. The chicken comes out super tender, juicy, and flavorful. Because the flavorings are versatile, you can serve this spatchcocked chicken with pasta, rice, roasted vegetables, or a salad. I served the sliced meat over a basic risotto I made while the chicken was roasting, then sprinkled the dish with some sliced cherry tomatoes and fresh herbs. It was an incredibly satisfying meal, and we’ve got tons of delicious leftover chicken that’ll feed us for a couple more meals, at least. To spatchcock, or butterfly, a chicken, you need to turn it upside down and cut out the backbone. It’s not hard to cut through the chicken: you can do this using kitchen shears or a sharp knife. 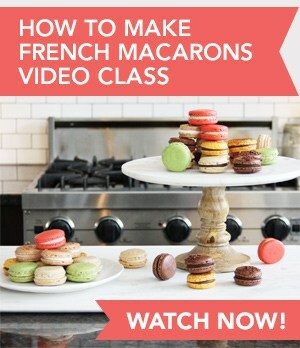 If you need to see it done before you attempt it for the first time, read through this helpful post by Serious Eats (there’s a video, too). If you don’t feel like doing it yourself, you might be able to find spatchcocked chicken at your grocery store, or you can ask the butcher to do it for you. Use a pan that fits the spatchcocked chicken snugly. 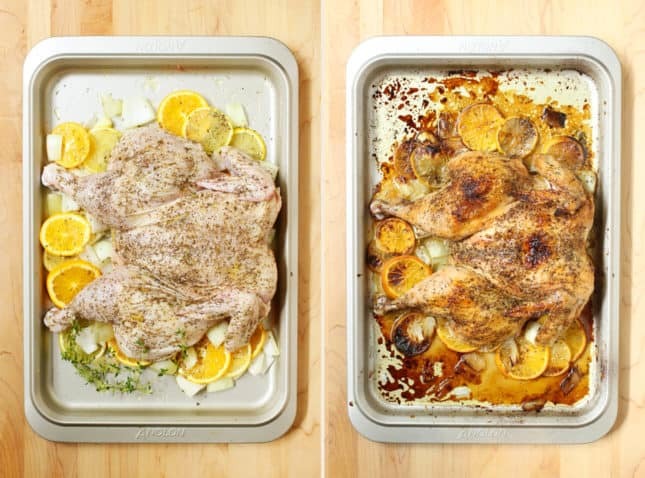 If the pan is too large, the juices will spread out thin and evaporate during the roasting process. I wanted to get more pan juices, so I added 1/2 cup (125 ml) chicken stock halfway through the cooking. This is optional, but I’m pretty sure you’ll appreciate the extra sauce to drizzle over that delicious chicken! The recipe suggests using both fresh and dried herbs, but if your flowerboxes are overflowing with fresh herbs like mine are this time of year, feel free to use fresh, making sure to double or triple the quantity for the best flavor. 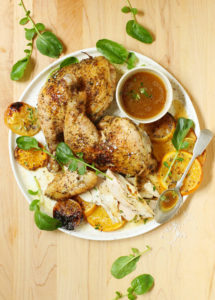 This easy roast spatchcocked chicken recipe creates super tender, juicy, and flavorful meat you'll enjoy with a delightful pan juice created by the lemons and oranges during cooking. Serve this versatile, weeknight dinner solution with pasta, rice, roasted vegetables, or a salad. Place the chicken on a cutting board, breast-side down. Using kitchen shears or a very sharp knife, cut through the bones on each side of the spine—you’ll end up with a long piece of chicken carcass that includes the chicken neck. Place the bones in a resealable plastic bag and freeze for a future stock, if desired. Flip the chicken over and firmly press down on the breastbone to flatten the chicken. Brush 1 tbsp (15 ml) of the olive oil over the bottom of a 13 x 9 inch (33 x 23 cm) roasting pan. Peel the onion, then chop it onto medium pieces and scatter in the pan. Peel the garlic and add the cloves to the pan. Thinly slice the orange, without peeling it, and place over the onion and garlic. 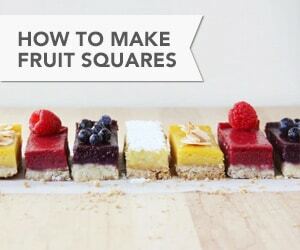 Thinly slice the lemon and add it in between the orange slices, or on top of them. Place the fresh thyme and rosemary sprigs in the center of the roasting pan. In a small bowl, mix the dried herbs or the finely chopped fresh rosemary and thyme with the salt and pepper. Rub the spice mixture all over the spatchcocked chicken. Place the chicken skin-side up on top of the flavorings set in the roasting pan. Turn the chicken legs outward so that as much of the skin as possible is at the top. Drizzle the chicken with the remaining teaspoon of olive oil. Roast for 50 to 60 minutes, or until the chicken reaches a safe internal temperature (see note). If using the chicken broth, drizzle it around the spatchcocked chicken halfway through roasting. At the end of cooking, if desired, broil the chicken for 2 to 3 minutes to crisp up the skin. Just remember that the skin can go from crispy to burnt in a few seconds, so make sure to watch over it carefully. SERVING: Serve the sliced spatchcocked chicken with the orange-lemon juices from the pan. Roasting makes the orange and lemon slices super tender, which means you can eat them along with the chicken, but you can also press them to add their juices to the sauce, discarding the rinds. 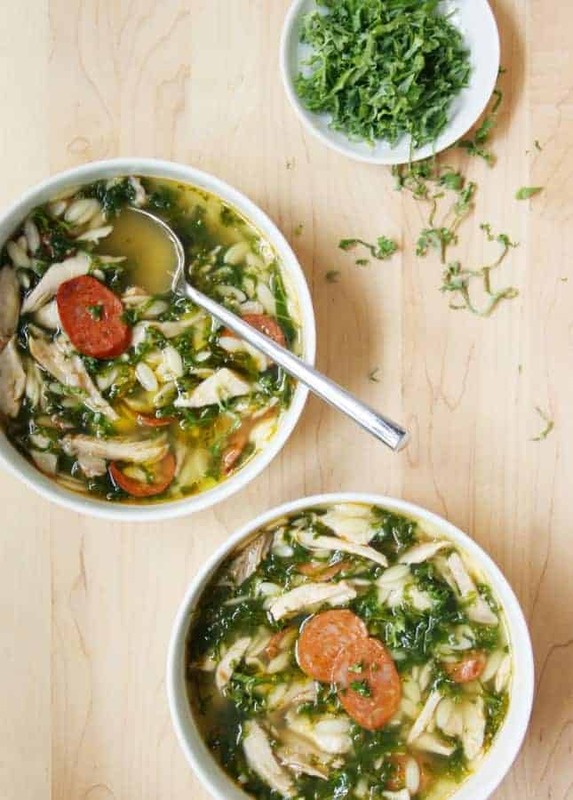 STORAGE: Refrigerate leftover chicken in an airtight container in the fridge for up to 3 days. Safe internal temperature for whole cooked chicken is 165°F (74°C) in the United States and 180°F (82°C) in Canada. 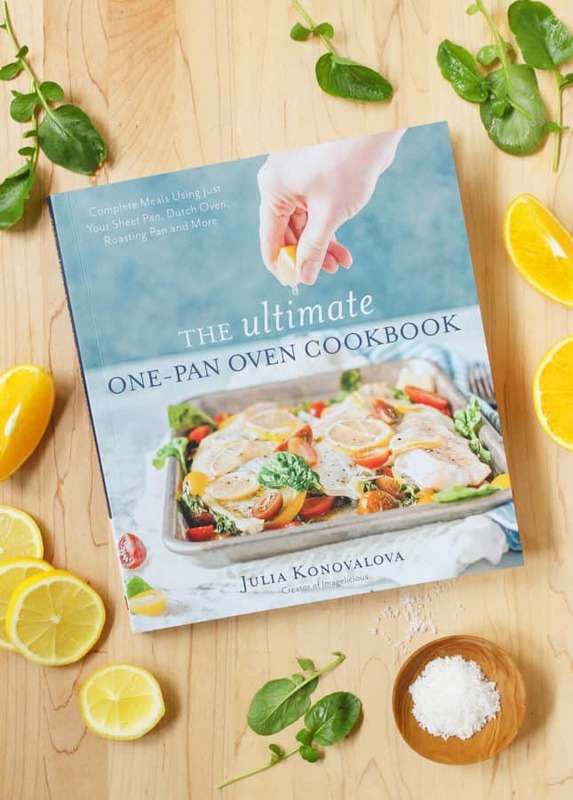 Disclosure notice: I was offered a copy of The Ultimate One-Pan Oven Cookbook by the author, Julia Konovalova, and her publisher, Page Street Publishing Co. As always, companies never dictate the content I create, or the opinions I express. I only use products I genuinely believe in or feature books I truly love. This post also contains affiliate links. For more information, please read my Disclosure Policy. Roasted asparagus and mashed Yukon potatoes. I usually serve roast chicken with roast potatoes or basmati rice! 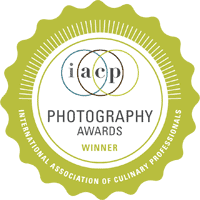 Thank you for the chance! I just can’t stop imagine this deliciosos chicken with rice!!! Plain and simple! I generally serve roasted chicken with a light and tangy salad and some kind of roasted or grilled veggie. Fennel is one of my favourites. I serve roast chicken with roast vegetables in spices and olive oil. I love serving smashed Yukon potatoes and roasted vegetables (brussel sprouts, cauliflower, and carrots) with my chicken. Sometimes I’ll toss some fennel in. Thank you so much for this glorious review and your kind words about my recipes. It means a lot! It’s very scary putting yourself out there to be judged (as you also know I am sure). So, thank you! !